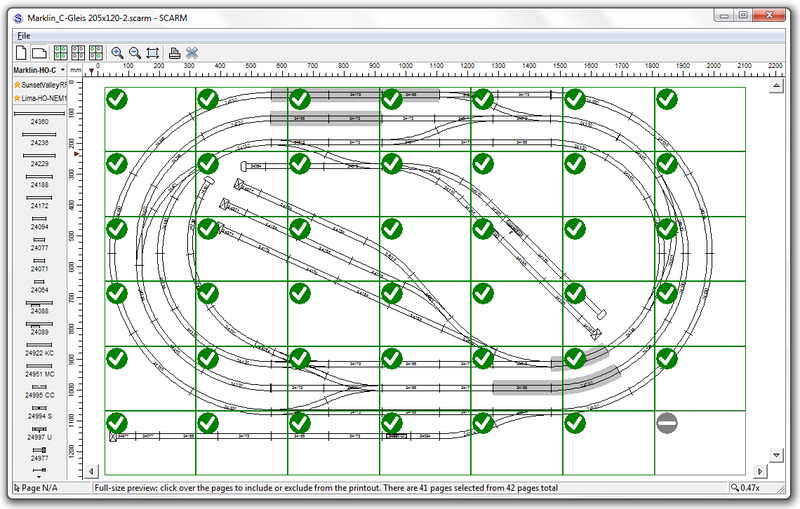 SCARM 1.0 supports fully automatic printing of the track plan in real scale (1:1), but that feature is enabled only in the licensed version of the program. If you are using the freeware version, you should do the printout manually, page by page. If you have SCARM 1.0 with license key, use “File” > “Print” menu command and then in the “Range”, select “All” and place a check mark on the “Full size (1:1)” option. You can then print the track plan immediately or click on “Full-size preview” button in the bottom left corner of the Print dialog box and see how the track plan will be printed. In the preview window, you can select the pages orientation or click over a given page in order to include or exclude it from the printout. When ready with the preview, select “File” > “Print” menu command to start the full-size printing. The pages will be automatically numbered like i.e. “5-2″ which means Column 5, Row 2. You must not cut the white fields (printer margins) of the pages nor overlap them – just align the page borders side by side over the table. 1. Make sure that you have defined a baseboard for your layout with “Edit” > “Create Baseboard” command. It is needed to visually set the boundaries of the track plan and to help in orientation from where to where to print. See How to create baseboard FAQ topic for more info. To quickly create rectangular baseboard around existing track plan, hold Shift while selecting Create Baseboard command. 2. Check the position of the layout on the drawing plot. Move it to the beginning of the coordinate system so the upper left corner of the layout to be as close as possible to the coordinates center (0,0). Zoom in for more precise matching. The rulers and the grid can help you with the orientation. To show the rulers (if they are turned off), press ‘R’ key. To toggle the grid between dots, lines and off, press ‘G’ key. To select all items on the drawing plot, hold Ctrl and press ‘A’ key. To move the selection, right-click over selected item (i.e. track or figure) and use “Move” command from context menu. Press “1:1″ button from the toolbar – this will enable Print Preview mode and will adjust zoom factor to 1:1 according to your printer’s default page size (probably Letter or A4). Then press Home key from the keyboard – this will move the view in the default position so (0,0) will be in the upper left corner of the screen. Now you are ready to print the first page. A new option in the “View” > “Scale” menu is available, starting from SCARM v. 0.9.19. It is called “Lock Zoom” and is intended to preserve the zoom factor (to 1:1 in this case), disabling zooming by mistake with mouse wheel or by the ‘+’ and ‘-’ keys. It is useful “Lock Zoom” option to be checked during full-size printout procedure – a small yellow padlock will be displayed in the right corner of the status bar, showing that zoom is locked. You need to write a number to the page i.e. “R1/ C1″ for 1st row and 1st column or “A1″ where A, B C,… will stands for rows and 1, 2, 3,… will stands for columns. You can put the number inside SCARM drawing, using text entering feature (“Edit” > “Place Text”) or you can write the number by hand after printing of each page. Note Numbering is important – otherwise you will have a printed puzzle to solve. Select “File” > “Print…” command and Print dialog box will appear. In “Range” field, select “Current page”. Pressing of “OK” button will send current page to the printer. If necessary, adjust printer properties such as color and quality, but do not change page orientation or page size. If you need to change the page size, do it from the printer driver dialog, which is called by pressing of “Properties” button. When ready, close the printer driver and then press “Cancel” button in Print dialog box. Then start over with pressing of “1:1″ button and Home key. The page orientation is always selected automatically by SCARM. When the first page is ready (printed), hold Ctrl and press right arrow key from the keyboard – this will move the view exactly one page to the right – this will be the second page. Print it and don’t forget to number it. Do it again and again until you reach the blue line of the baseboard border. Print the last page of the first row and then press Home key – SCARM will return the view to the initial position (the first page in top left corner). Now hold Ctrl and press down arrow key from the keyboard – this will move the view with one page down to the second row. Print that page (don’t forget the numbering) and then print all other pages in the row, by moving with Ctrl + right arrow key. Do this for each row and pages in it until you print all of the pages in your layout. Do not turn the mouse wheel and do not move the view (by mouse or by arrow keys). If you accidentally change the zoom or move the drawing plot, press again “1:1″ button and press Home key – this will bring you to the first (top left) page again. See your last printed page number and move to the next page in the printing sequence by holding Ctrl and moving with the arrow keys. Note that SCARM automatically takes into account the printer margins (the white spaces at page borders where the printer is unable to print). You do not need to cut or overlap the white spaces – just align the page borders side by side and the printout will be exact. This is the whole procedure for the freeware version. It is not very convenient and can be quite difficult for large sized track plans or layouts with custom shaped baseboards, so if you have a complex design that you intend to build, you can always get a SCARM License Key and leave that job to the program. This entry was posted in Advanced Techniques and tagged 1:1, full size, print, printout, whole layout by Milen Peev - Author of SCARM. Bookmark the permalink. I have purchased a license key. But when I print the track plan in 1: 1, the page is empty. If I print everything on 1 page, it’s fine. What is wrong? There is a bug in the automatic 1:1 printout routine in v. 1.0.0. It expects the track plan to be aligned to the beginning of the coordinate system (0,0) like in the manual procedure. I will fix that and will release updated version 1.0.1 in the beginning of the next month. Sorry for the inconvenience. Is there any way to only print the center line of a layout ? Great job with SCARM love it. Yes, If you mean the center lines of the tracks. Just select “Centers” in the track drawing options (“Tools” > “Settings” > “2D View” > “Tracks”) and deselect all other that you don’t need. After using the measuring tape it indicates the size layout I would like. When I print 1:1 using the steps in the free version. After laying out the paperwork on my bench work. The track sizes seemed small. I tested a simple n scale code 80 atlas 5” track its about an inch longer than the printout. I also tested a 9.75 and 11 both were not accurate. Is there something I’m doing wrong? Perhaps your printer is not printing 1:1, (i.e. it fits the whole page into its printable area) or the page size is wrong (i.e. it is set to print in A4, but the paper is Letter). Note also that Atlas N scale C80 tracks are little bit shorter than what is written on the label. I.e. the 5″ straight is actually 4.88″ when the real track is measured. However the difference is just 3mm and not whole inch. Hi. I have an HP Officejet 7500A Wide Format printer which prints on A3 size paper. The advanced print menu only shows A4 A5 or A6. Is there a way to print the 1:1 track plan using this size of paper as it would save a lot of joining? Yes, if this size of paper is supported by the printer driver, you should be able to select it in the driver’s dialog and SCARM will then be able to make the 1:1 printout on it. If you cannot see this paper type in the printer driver’s dialog, look in the printer’s manual what can be the cause (i.e. wrong tray selected, no paper, etc). Hello. I have been attempting to print my track plan at 1:1 to no avail. I’ve bought the licensed version of SCARM and followed the instructions, yet when I try to print, I’ve gotten several dozen wasted pages with nothing but the filename and “Printed by SCARM” on them. What version of SCARM do you use? There is a bug in v.1.0.0 that may give such results, but it was already fixed in v.1.0.1. If you have the most recent version (1.2.0), send me your project file for reviewing and I will check where is the problem. The program prints in the same way on any paper size. However, there may be some settings in the different printer drivers that alter the printing i.e., some drivers automatically fits or enlarges the content on the page by default. Check your driver to be sure that it prints everything “as is” and always ensure that you print in the correct scale within the program. Hello! Is there a way to set portrait mode when printing (not 1: 1). I try to set it through the properties of the printer, but when I open the preview window of SCARM it is reset to landscape mode. Do the following: start the program, lay some straight track and then rotate it at 90 degree, so it becomes vertical. Then select “View” > “Show as Print Preview” – the preview will show in portrait mode. Now open your plan and print it.